"Leveraging Electronic Health Records (EHR) System Analytics"
Leveraging Electronic Health Records (EHR) System Analytics helps drive safer, more efficient patient care and truly achieve the potential of having all of the patient’s critical health information at the physician and care team’s finger tips. 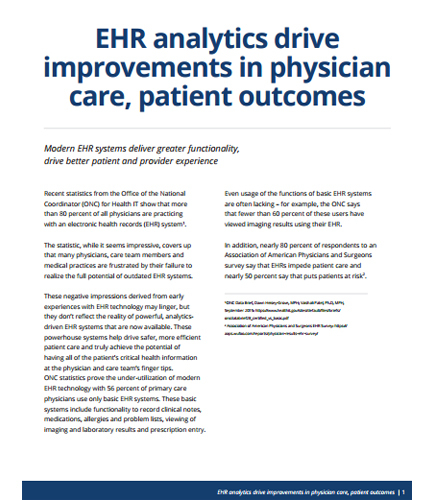 This descriptive whitepaper explains how modern EHR systems deliver greater functionality and drive a better patient and provider experience. What is Intelligent Analytics ? With Intelligent analytics, organizations gets an opportunity to unlock performance improvements through making the right decisions from extracted information out of the immense volumes of data available . Intelligent analytics can help in future consumption and costs of an organization. It helps to maximize savings and improve business performance as well as in efficient business planning.